Mirror, mirror, on the wall, who’s the fairest of them all? If you don’t like the answer, then perhaps it’s time for you to get a serious facial to kick dark spots and blemishes to the curb. From radiance-boosting indulgent sessions to intensive wrinkle-busting treatments, we’ve rounded up some of the best facials in Bangkok to get your glow on. Ladies, this is the facial treatment you want to splurge your hard-earned money on. Wild Clinic’s signature treatment really gets down to business removing those pesky blackheads and PM2.5 impurities. Drink three vitamin-boosting detox juices—way to drink yourself clean!—before the 75-minute session that includes a face cleanse and coconut oil and orange pulp mask to give your skin extra nutrients. The specialist will then use Cryo Blue Light Therapy to help kill acne-causing bacterias, followed by the real star of the session, the HydraFacial, a full detox and rejuvenating treatment that claims to effectively deep clean, exfoliate, extract and hydrate your skin with intensive serums. Top it all off with LLLT (Low Level Laser Therapy) that helps stimulate collagen for a youthful and brighter complexion. Wrinkles and dark spots be gone! logy and natural ingredients, the 45-minute treatment will leave your skin feeling so plumped and nourished, you’ll be sure to come back for more. The session involves a cooling treatment called “Cool Mesoporation,” a needle-free technique that uses safe electrostatic pulses to carry vitamins deep into the skin’s layers. Photodynamic Therapy (PDT) then follows for collagen boosting and skin strengthening. Another neat thing about this Vita Cool treatment is that it can be tailored to your skin’s condition, offering up to five different types of treatment with over 11 ingredients from mother nature. Get the glow with “Diamond Bright,” which uses vitamins from berries and grape seeds, as well as black pearls to reduce dark spots and lighten uneven skin tones, or smooth away those signs of aging with “Fearless Aging,” which includes wrinkle-busting ingredients like berry peptide, wild cacay oil and “dragon’s blood” (a natural tree resin, but you can still channel Daenerys). Fed up with wishing you could replace your old and tired skin with a new one? Well, your prayers have been answered. Meet Bangkok’s ultimate anti-aging facial, “Second Skin,” an innovative treatment developed by French luxury skincare brand Biologique Recherche. Exclusively available only at The Peninsula Spa, the high-tech treatment utilizes revolutionary electro-spinning technology—similar to 3D printing—to weave out nanofiber hyaluronic patches that stimulate collagen production and reduce the amount and depth of wrinkles on your face. The 60-minute treatment begins with a face cleanse using cleansing milk, before Biologique Recherche’s exfoliating Lotion P50 is applied to help moisturize and restore your skin’s natural PH balance. 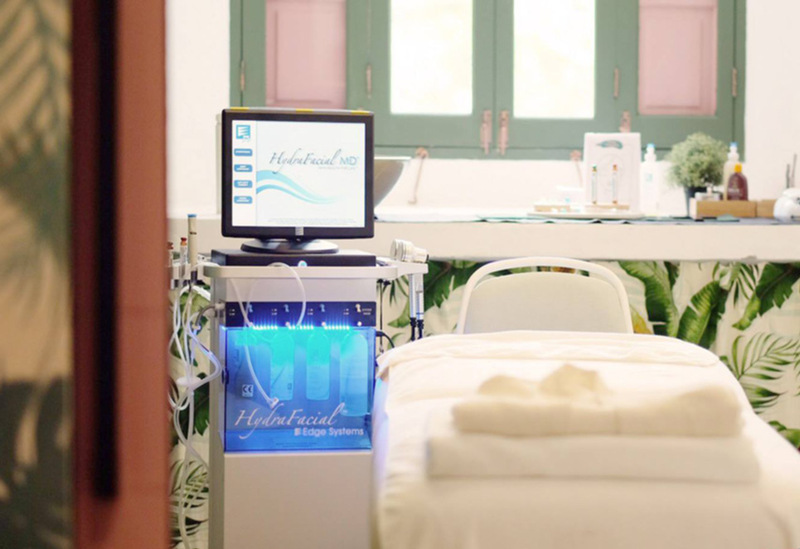 Next, the spa’s specialist will carefully apply the hyaluronic patches to fill in fine lines and wrinkles, before gently massaging Serum Seconde Peau (Second Skin Serum) into the patches for full absorption. To finish, Creme Masque Vernix facial moisturizer will be lightly massaged onto your face, leaving your skin looking young and vibrant. essential oils. The session begins with a calming face cleanse followed by a gentle exfoliation and massage to further nourish the skin and boost your circulation. While the rose works its magic, you’ll also be treated to a tension-busting head, back and shoulder massage that should leave you feeling as wonderful on the inside as you’ll look fabulous on the outside. Japanese tanakura clays—which Thann claims can effectively blitz dirt, toxins and stubborn makeup from your pores. This is followed by the oatmeal face scrub and rice extract moisturizing cream to further exfoliate dead cells and other impurities, as well as to help moisturize, nourish and smooth out your complexion. As you’re dozing off to the rhythmic massage movements on your face, you’ll also be treated to a head, neck and shoulder massage with Thann’s Nano Shiso Body Butter moisturizer. All products used are from Thann, of course, famed for its all-natural, aromatherapy goodness.